559HA-SS-DST is rated 4.5 out of 5 by 25. Rated 4 out of 5 by Monica C from Great looking sink I've bought a handful of Delta Trinsic sinks for my new home. I have almost every style throughout my house. They all look great. Sleek, modern design, and less pricey than some of the other competitive brands. We've had them installed for almost a year, with no issue. The only reason I gave 4 instead of 5 stars was because the install was not easy. My husband complained that it was a two-man job, which annoyed him. Water flows out nicely. Easy enough to clean. We've been very please with our purchase. Rated 5 out of 5 by Burkholder Builders from Love it It looks great with our black cabinets and white quartz counter top. I like how it only needs one hole, easy to clean and the turning option is fantastic. Also the pop up plug is so much better than the pull type. I love everything about this faucet. 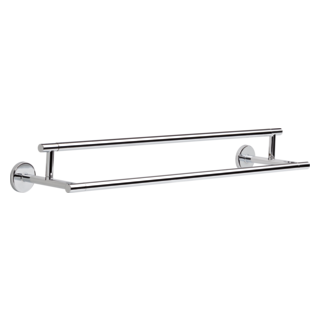 Rated 5 out of 5 by Brad from Bathroom faucet review The faucet feels like quality, easy to install and looks great. Fair price for this product. 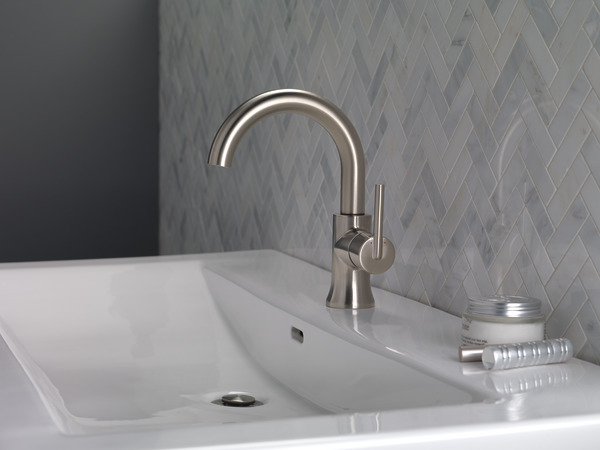 Rated 5 out of 5 by PdxDesigner from Simple and sleek faucet I went with several pieces from the Delta Trinsic line, and it all looks beautiful! I love the simplicity, and the black looks amazing against all of my white tile. I did not personally install this faucet, but it is easy to use and looks great. 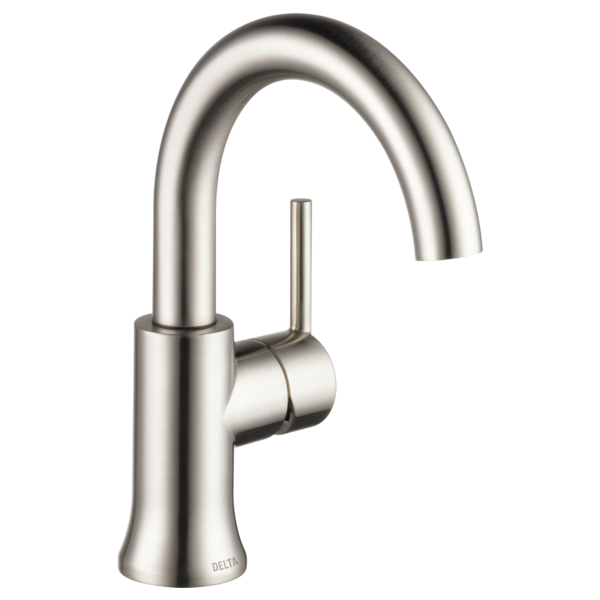 Rated 5 out of 5 by Sandy1256 from Statement bar faucet Our update is bar in our rec room included leathered granite and this stainless steel faucet. Great modern look. Very pleased! Rated 1 out of 5 by Retrogirl from Don't buy this faucrt Bought this for lavatory t ok match 2 in kitchen. Water trickles out . It would take 30 mins to fill up a small sink! Rated 5 out of 5 by alexmarah from Beautiful faucets We got two of these in matte black and we are very pleased with them. The faucet looks great and works great! Easy to install and well worth the cost. Is the trinsic faucet manufactured in the United States? 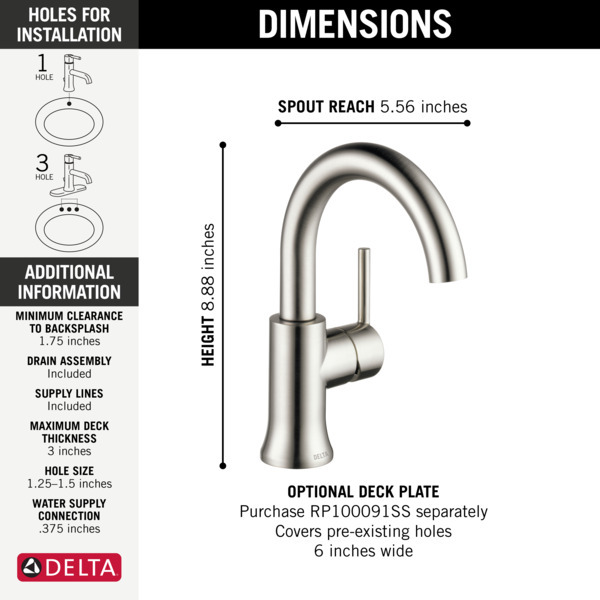 Our plumber ASSURES us that on his printed estimate for our Trinsic tub filler &amp; single-hole faucets ARE the Brilliance finish. Yes or no? 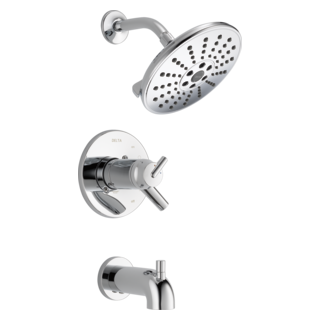 (tub filler: #T4759-SS FL/R4700-FL; sink faucets: #559HA-SS-DST) Also, what does the SS refer to? Thanks! Was a deck plate ever developed for this faucet so that it can be used with a 3 hole, four inch center set sink? 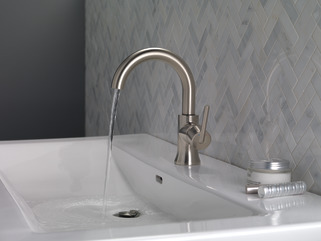 Is this a low or standard flow faucet? The Amazon.com review states that: &quot;... Delta said it's a low flow and that's just the way it is...&quot; What's the max GPM for this faucet? What accessories go with the champagne gold? I don't know where to look for matching knobs/pulls. Hello, Where is the drain pull for this faucet? How does water stay in sink? Does it come with drain assembly? I would like to adapt a spray hose with a diverter to the aerator connection. I believe I will need to use a thread adaptor since the aerator thread is small. 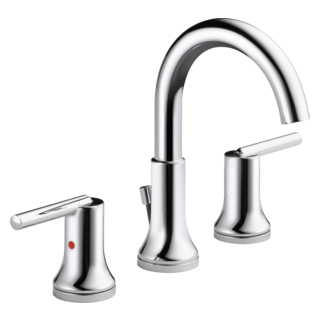 I have two 523LF-TGMHDF faucets that I want to replace with the Trinsic Single Handle High-Arc Lavatory Faucet is there anything I can do about the lack of a base plate?